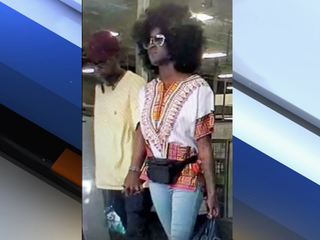 BOYNTON BEACH, Fla. -- Boynton Beach police are looking for two people they say stole credit cards from a woman’s purse and spent thousands of dollars. Wanda George said she was eating dinner at the Village Tavern in Boynton Beach and had her purse hanging on her seat behind her. She said it wasn’t long after she sat down that she got a text saying someone was trying to use her credit cards. “I got to the restaurant at 4:15 and by 5:15 all this started taking place, and they went right down the street,” said George. Police say a man and woman took George’s cards and used them to purchase $3,000 worth of merchandise at Best Buy. The couple then went to Target next door and tried buying $1,500 on gift cards but were declined. “It was very disturbing because you have to be very bold to do that,” said George. George said she is certain someone grabbed her cards by reaching into her purse and taking out her wallet, grabbing her cards, and putting her wallet back. People in the shopping center of the restaurant said they eat in the area all the time. George said she wants to make sure this doesn't happen to anyone else and felt she was targeted by the suspects. Her credit card company was able to work with her to get her money back, but she said this is a lesson learned. Boynton Beach police are asking anyone who recognizes the couple to contact them.